There have been a number of people throughout history whose actions have changed Azerbaijan. They includes famous politicians, art and cultural figures who have helped to shape the country's history. 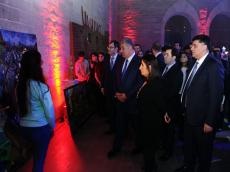 An exhibition "Historical Figures of Azerbaijan Through the Eyes of Young People" opened at Dash Salname museum on December 20. Members of the Baku State Vocational Training Center for Culture and Crafts, art-studio under the Zira Cultural Center and art lovers attend the event. In his speech, Minister of Youth and Sports Azad Rahimov stressed that the main goal of the exhibition is to instill a sense of patriotism in the young people and support their creative potential. Over 130 works in the history of painting, calligraphy, ceramics, painting, graphics, engraving, batik, stained glass and gravure styles are put on display. The portraits of such historical figures as Tomris, Babek, Shah Ismayil, Javad Khan and other national heroes were presented at the exhibition. The exhibition will run until December 24.